Patook is an app and website that allows you to make strictly platonic friends with people nearby who share your interests. Swipe right if you'd like to be friends with that person, or left to skip for later. If you both swipe right on one another, a mutual match notification is sent. You can join as individuals or as couples. Patook is for friends only. We believe we have the most advanced flirt detection algorithm in the world, and it will ban and block any users who aren't here to make friends before you even hear from them. Detailed profiles and interest matching algorithms allow you to find people who share interests and opinions with you, and you can take questionnaires to refine your matches any way you'd like. You can also make public posts that are visible to all people nearby, and thereby kickstart conversations among people. Only want to be visible to women? No problem. Women and gay men? Done. 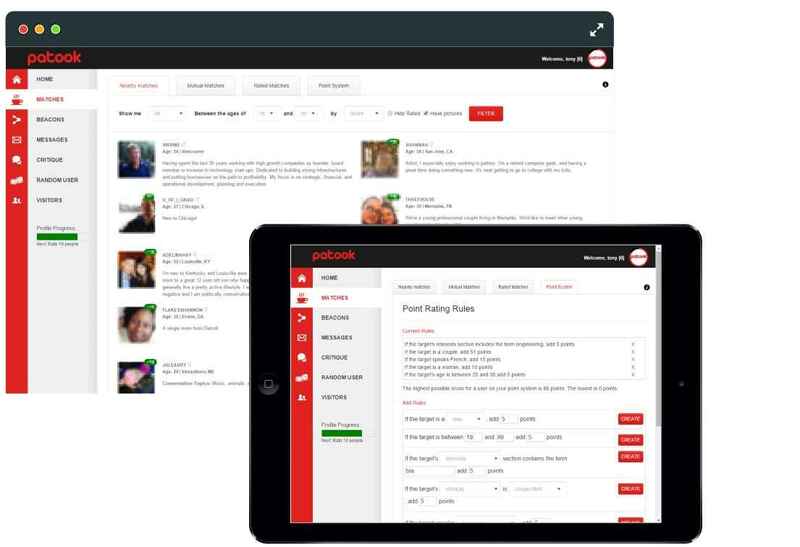 Patook allows you to customize who you can see and who can see you. Patook uses artificial intelligence to detect lulls in conversations and to help it keep going and suggest users actually meet. As a result, the reply rate for messages that are read hovers above 80%. Patook is available as an app for iPhone, iPad, Android, and tablets. It is available as a website for PC, Mac, laptop, and desktop browsers. View many more on the respective app stores. Patook users are kind and respond to over 80% of messages from new users they read (statistics over the last 200,000 messages). Patook includes users from all genders, including men, women, couples and non-binary genders, from all ages, ethnicities, and orientations. Fewer than 1 in 10,000 messages get reported by users and 100% of all user reports are dealt with. We believe that it gets harder to make new platonic friends when you hit adulthood. After running a survey of over 2,000 US adults, we confirmed that only 1 in 4 adults find it easy to make friends. And that number drops to 1 in 5 after moving to a new city or place. We also believe that there are some awesome people around you who share your interests, who you might otherwise never meet. So we thought: there must be some apps or websites that address this problem out there, right? Well there are some, but they suffer from one pretty difficult problem - users who are there looking for more than friends tend to push actual friend seekers out. The entire concept of Patook is therefore based on building a platform where such behavior results in an immediate ban. If anyone attempts to flirt on the app or the website, not only will their messages not get delivered, they will also be permanently banned from the site. And it's all done by an artificial intelligence robot that was trained specifically to recognize flirty, creepy, needy or aggressive behavior, and that evolves every day based on the new data it receives. Or view our FAQ to learn more.